Info "What a tangled mess." Snake Snarl is one of Fronk's microgames in WarioWare: Twisted! 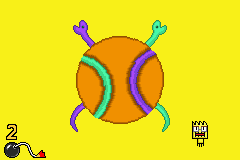 In this game, the player controls the bodies of two snakes. One is a greenish-blue color and the other is purple. The player has to align said bodies with their respectable heads and tails. 1st level difficulty: The bodies are placed one beside the other, with no tangle. 2nd level difficulty: The bodies are tangled up. 3rd level difficulty: The bodies are well tangled up. This page was last edited on November 16, 2018, at 22:07.